Fyrværkeri (fireworks) are legal in Denmark (except for bungers or bombs). This week has been so much fun re living my early childhood as its been 30 odd years since fireworks were last sold in good old nanny state Australia. For two weeks I have been travelling around the town checking out all the markets and shops. I ve purchased samples and tested the products out in the kitchen as its raining outside. I've even modified the Hex Hyl (Witch Howl) (see the yellow ones below) into an excellent explosive (Bunger) with the help of a 14 year old danish kid on you tube. The choice of pyrotechnic goodness is a amazing here. 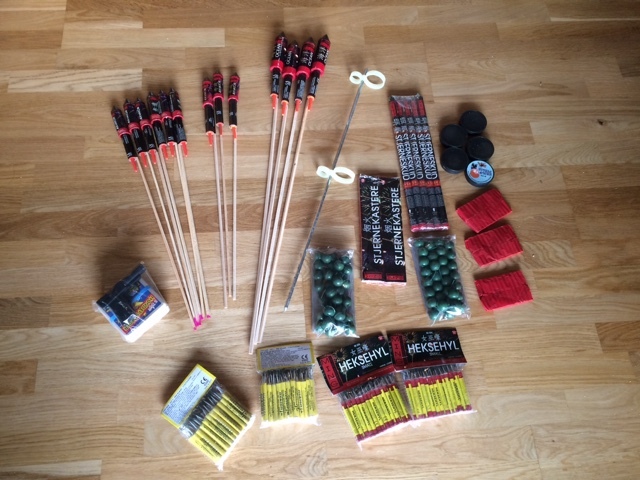 It ranges from high end batteries of professional grade fireworks ie a case about the size of a slab of beer that you light and stand back to watch a curated display, through rockets(rackets) of all sizes, down to throw downs (knadperler), hexehyl, jumping jacks etc. Sale is legal from 15 dec through 31 dec and its legal to let then off between 27th dec and new years day. So I had a few weeks of going for evening walks around the lake letting of crackers, woohoo. On new years eve it gets ridiculous. As soon as it gets dark (4pm) there are fireworks going off all over town. This builds to a crescendo around midnight when there are so many going off the sky is full for two hours and the smoke is as thick as fog. The good lady Wilde and I took out meager (by Danish Standards) bag of fyrewærkeri down to the castle lake and spent a glorious hour or so letting them off. I purchased some rockets for the good lady and these were the highlight of our fun.